Giclée prints are a fantastic way to showcase digital artwork or reproduce limited edition fine art prints. A 70 year archival life ensures your images stay looking great well into the future. You can now order giclée prints up to 30x20 inches via our Imagine online ordering system. Simply click the button below, upload your images and choose Digital Prints >Fine Art Giclée. Giclée printing is ideal for art reproduction, limited edition fine art printing or the printing of large format graphic illustrations. With a variety of paper surfaces to choose from, Giclée printing is a firm favourite with our artist clients who wish to reproduce their original art works. If you have an original that requires colour accurate digitisation, please see our Art Reproduction page. ‘Giclée prints’ is the term used for professional inkjet printing. The principle is similar to your home printer, ink is squirted onto paper to produce an image. The benefits of Giclée printing are large size prints, artisan papers and brightly saturated colours. 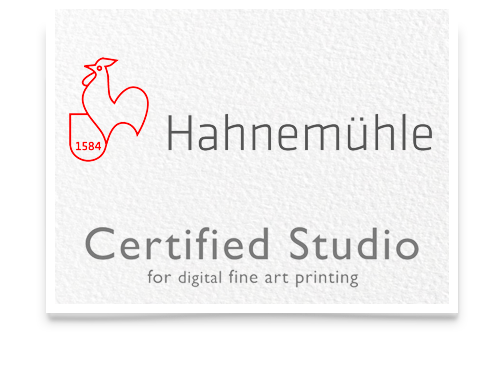 CC Imaging is privileged to be one of Hahnemühle’s certified studios. Hahnemühle’s meticulous selection process endorses the quality and consistency of our giclée print process, so why not browse our selection of leading giclée papers. What does Giclée mean? The word Giclée was coined by Jack Duganne and is based on the French word gicleur (meaning nozzle) as a reference to the printing process. Giclée printing is a particularly common media for digital artists and fine artists who wish to produce limited run duplications of their original works. Traditionally, Lustre and Gloss inkjet papers performed poorly in comparison to their C-Type cousins. Reproduction of fine art faired better as Giclée printers would use a heavy stock of rag (a paper similar in texture, tone and appearance to artists’ watercolour paper). Modern Lustre and Gloss Giclée papers are a fantastic alternative to C-Type prints, offering a high level of colour saturation and finely rendered detail. Our Giclée printer of choice is the professional 60 inch, wide format Epson SC-P20000. It is capable of printing onto a wide variety roll or cut sheet media. As a Hahnemühle certified studio our strict workflow requires Epson’s UltraChrome Pro 10 ink system paired with in-house paper profiling (via i1Photo Pro 2 Spectrophotometer), guaranteeing the very best print possible. The type of paper has a great influence on how light reacts with your image and if there is one thing photographers and artists are keen on, it’s light. A hand picked selection of Fine Art Guild assured papers provide a consistent and professional result, leaving the choice of which paper purely about the application of the image. This acid- and lignin-free classic meets the most exacting requirements for age resistance and is specially designed for FineArt applications. The mould-made etching paper features a distinct textured surface. This professional grade 250gsm paper is close in texture and finish to C-Type Lustre paper. High saturation and low reflection make this ideal for portfolio and display output. Fuji Matt Bond is a high resolution, medium weight media (180gsm). The coating takes ink well and reproduces highly saturated colours well. Being a matt paper, reflection is very low which lends itself to a fine art/painterly image type. A lighter stock of paper which can easily be manipulated around shallow bends, ideal for installations. Mounting is preferable if prints are to be hung for any length of time. Making sure it’s perfect 1st time & every time. Our Epson SC-P20000 will always print at a resolution of 1200dpi or above. This really just means that each square inch will comprise of 1200 dots of ink squirted (with precision) onto the paper. We guarantee you will always receive a beautiful print. However, submitting a low resolution file, or one that is incorrectly formatted, may result in a beautiful print of a poor image. Sized at your desired print size (so if you want a 16×12 inch print, size it to this). Level 12 jpg or uncompressed flat tif. For information on cropping, sizing and colour correction, please visit the School of CC. The time it takes to print and dispatch your order. Giclée orders will generally be printed within 48hrs of receiving your order (Mon-Fri). We will provide an email when your order is dispatched, so you know that it’s on its way. How long your order takes once it has left our premesis depends on the service you selected. Standard Delivery is a 2nd class Royal Mail service. Please allow up to 5 working days (weekends and bank holidays are not classed as working days) for your order to arrive. Being the Hahnemühle certified studio for Yorkshire, we welcome visits from artists who are passionate about their work and have a critical eye for quality. Square prints are charged at the same price as rectangular prints. The size of your image will equal the shortest side of a standard rectangular print.